Newer: » Wanted Slovakian Karol Mello arrested by Interpol; lawyers fight his extradition! Over the past few months there have been numerous reports of burglaries that have accompanied the escalation of crime on the island. On Tuesday morning there was yet another burglary and this time it was a charitable organization that was the target. 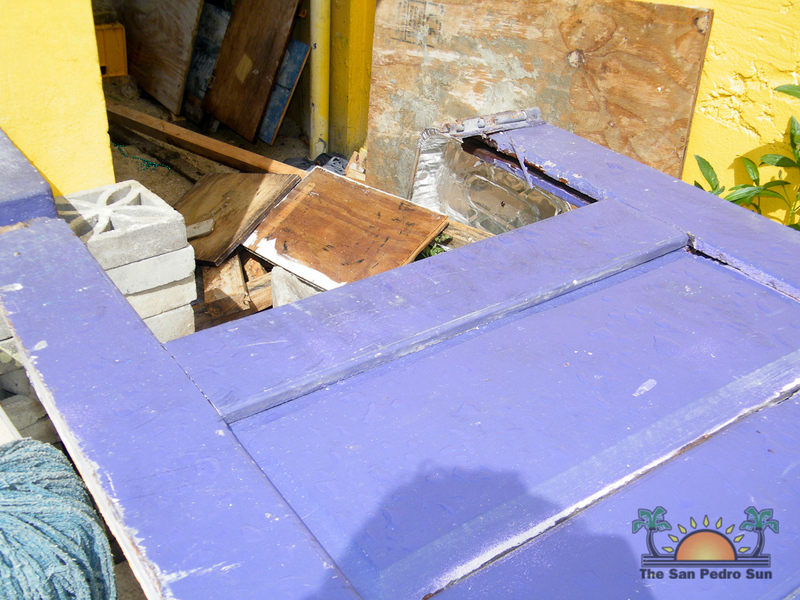 The San Pedro Lions Club located at the corner of Barrier Reef Drive and Pelican Street in San Pedro Town was burglarized. According to the SP Lions President Mel Spain, shortly before 6AM, she was informed by the caretaker Lion Gonzalo “Reds” Lara, that the Den was burglarized. “I informed him to leave everything as is while I inform the police. By the time I got to the Lions’ Den, the Police was already there processing the scene,” said President Spain. The thief or thieves gained entrance by forcedly opening the main door then proceeded to break the lock and door leading into the kitchen area. 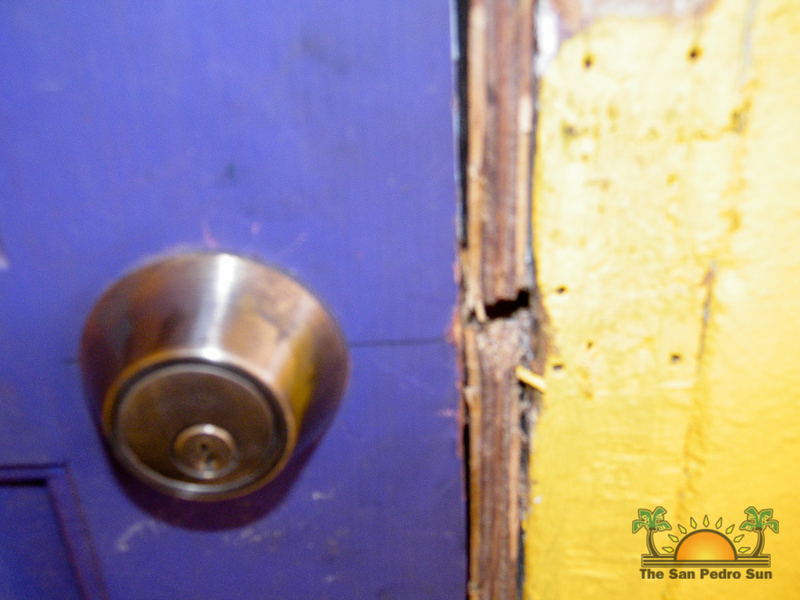 The third door that separate the kitchen and the bar area was stamped down and broken into pieces. 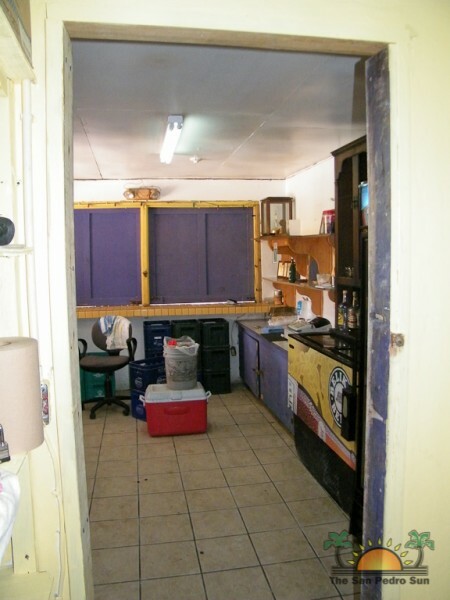 Once inside, the thief/thieves boldly to the time drank a complete bottle of Black Label Whisky and then took with them two bottles of Caribbean Rum, a black flat screen 32” Panasonic television and its remote control all adding up to a total value of $2200. “We at the Lions try to help everyone but at this rate, after we were burglarize and the expense we will have to undertake to replace two doors and television, we would not be able to assist anyone within perhaps the next two months,” said a very disappointed Spain. But who would want to steal from the Lions Club, an organization that helps the community have access to free eye and dental clinics, free medication and transportation when there is a need and even disaster relief? That’s the same question that has the SP Lions Club President baffled. “It is very disappointing that crime has reached to such a level. 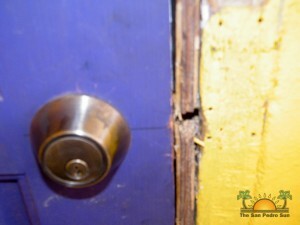 We don’t discriminate against anyone and we try to help everyone that knocks at our doors. We have been here for this community for the past 30 or 40 years so I don’t know which person, in their right senses, would want to steal from a charitable organization like ours. I would want to plea to the community, that if there is anyone that knows something to call the police, after all they are stealing from the community,” said Spain. The SP Police believe that thief or thieves gained access into the area by jumping over the fence sometime between the hours of 6PM on Monday July 16th and 6AM on Tuesday July 17th. Anyone with information that may assist the police in their investigation can call the San Pedro Police at 206-2022 or 911.